Thousand Islands tourist destinations are known for its natural beauty. Travelers, here are some information about interesting resorts that can be enjoyed in Macan Island and Putri Island of Thousand Islands.
" Just come to Thousand Islands and experience it yourself"
It takes about 1,5 hours to reach Macan Island from Marina Port, Ancol, North Jakarta. Macan Island has a clear and beautiful sea that can refresh and relax your mind. This island is known as 'The Best Gateaway in Jakarta'. Eco Resort of Macan Island provides all-in-one package for travelers. This package includes round-trip transportation of Marina Port - Macan Island using speed boat, accommodation, and meals with variety of prices between Rp 1,982,500 - Rp 2,734,000 for weekends and Rp 1,867,500 - Rp 2,619,000 for weekdays per person. It also provides travel package for children at age 3-10 with price between Rp 1,522,500 - Rp 2,274,000 for weekends and Rp 1,407,500 - Rp 2,159,000 for weekdays. In this package, travelers stay in cottages at Macan Island's Eco Village. It offers great sunset and sunrise views from the location. Travelers can also enjoy diving, snorkeling, stand-up paddle board, and also canoeing from Macan Gundul Island. 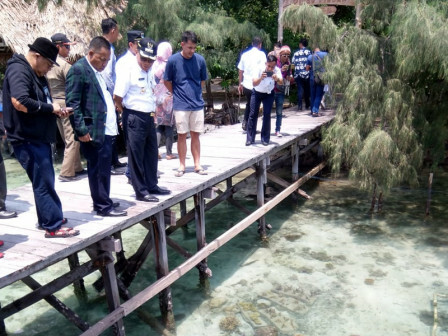 Macan Island General Manager, Chairul Saleh said, travelers who stay at eco village resort will be invited to do coral planting as a form of environmental care. "This package offers back to nature concept to increase our guests' awareness of the environment. For example, we are using solar cell technology for our electricity, we don't use AC and television in our resort to give a relaxing and comfortable atmosphere," he explained. It also takes around 1.5 hours to reach Putri Island from Marina Port, Ancol, North Jakarta. Putri Island is known for its beautiful fish and corals. Putri Island also has a resort that offers comfortable trip for travelers. It costs Rp 2,185,000 for two-days-one-night package per person for adult and Rp 1,290,000 for children at age 2-9. It includes a round-trip transportation of Marina Port-Putri Island, four meals per person, glass bottom boat facility to enjoy the beautiful underwater view, entrance ticket access for Under Sea Aquarium, Sunset Cruise, swimming pool and mini waterbom. Putri Island Operational Manager, Gusti Subagya stated, his side provides 70 comfortable cottages in Putri Island. "We also offer floating restaurant for residents who want to eat while enjoying breeze and ocean view," he added. According to Thousand Island Regent, Husein Murad, there are seven resort islands in Thousand Islands that can be enjoyed by travelers. Those are Macan Island, Putri Island, Ayer Island, Bidadari Island, Sepa Island, Pelangi Island, and Pantara Island. "Each inhabitant island and resort island has different tourism segments. It becomes our task, both government, local residents, and stakeholders to enhance Thousand Islands' potentials," he conveyed. Together with Thousand Island apparatuses, he is committed to support and promote resort islands thus it can drive the economy in Thousand Islands through tourism segment. "We also build a synergy with resort island managers to promote local IKMs and UKMs products in culinary, fashion and handicraft," he added. He informed that Thousand Islands is one of the National Tourism Strategic Areas (KSPN). Thus he encouraged people who want to experience marine tourism for visiting Thousand Islands first. "We have good facilities now, especially in tourism. Just come to Thousand Islands and experience it yourself," he stated.